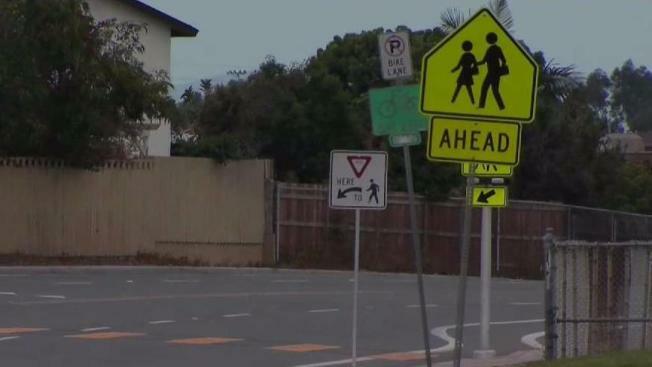 A man tried to kidnap a 13-year-old girl walking home from school in Otay Mesa West on Tuesday, San Diego police said. The girl was walking home from Montgomery Middle School on Picador Boulevard near Palm Avenue at around 5:17 p.m. when she noticed she was being followed by a black van, police said. The victim's uncle said his straight-A student niece was at school nearly two hours after the last bell doing extra credit assignments. Police say the van pulled up next to her and the passenger door was opened. A man inside reportedly asked the girl if she wanted a ride home before he grabbed the girl's wrist and tried to pull her inside. The victim was able to pull away from the man and run home to safety. A witness driving by told police they thought it odd when they saw the girl talking to the man in the van, so they made a U-turn and at that point saw the victim running away. The suspect was described as a man in his 50s or 60s with grey hair, a full beard with a raspy voice. He was wearing a grey or green polo shirt and gray pants. The van had a J or K in the license plate, police said. Meanwhile, parents in the neighborhood are on high alert. "I'm going to be more aware of my surroundings to see if there is anything suspicious, you know, call the police immediately. I'll be more aware of where my kids are, where they are playing," parent Amadas Lopez said. "We request parents and students continue to be aware of their surroundings when arriving and leaving school. To maximize awareness walking or cycling, avoid distraction from mobile devices. Traveling in pairs is always best."